Many were probably very shocked when they found out that multi-platinum selling iconic rapper and mogul Snoop Dogg announced that he was releasing a gospel album entitled “Bible of Love”. The rapper made the announcement in the earlier part of 2017 and has been hard at work putting it together ever since. After a year of hard work and anticipation, the 32-track, double-disc album is finally available for the masses to enjoy. Snoop has been very vocal about his love and admiration of The Clark Sisters and the entire family. We’ve also seen him on social media outlets showing love to the sisters. With that being said, it was no surprise when he reached out to them to join him on the “Bible of Love” album. The Clark Sisters chart-topping, Grammy Award-Winning song “Blessed & Highly Favored” is actually one of Snoop’s favorite songs. Snoop and J.Drew had already previously collaborated on the Faith Evans and Notorious B.I.G. project “The King & I”, so he eventually reached out to J.Drew about collaborating on “Bible of Love”. The result is “Blessed & Highly Favored” (Remix) and it is BLAZING…to say the least. Many are referring to the remix as the “trap version” of the original song. J.Drew takes on the original version of the classic Clark Sisters tune and definitely gives it an urban radio-friendly production that will easily bring an appreciation of the song to new audiences and fans. Along with brand new production, J.Drew also had his Mom (Karen Clark Sheard, who also sang lead on the original), lay down brand new vocals for the remix and literally breathed brand new life into the song. Snoop’s gospel album is entitled “Bible of Love”. It’s the rappers very first inspirational offering and it actually features some of the biggest names in both R&B and Gospel music. Snoop was very intentional in wanting the make sure the album included some of his “personal favorite artists” and that’s exactly what the outcome was. 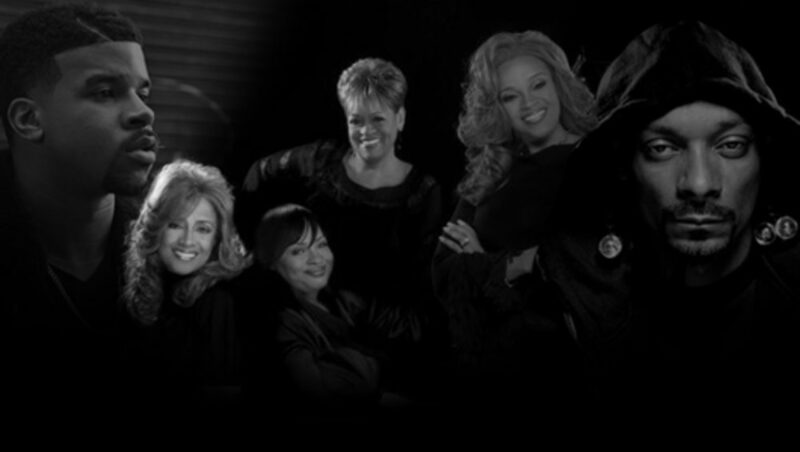 The album features award-winning artists such as Faith Evans, Mary Mary, B.Slade, Charlie Wilson, Patti LaBelle, Marvin Sapp, Rance Allen, John P Kee, Kim Burrell, Fred Hammond and of course the legendary Clark Sisters along with many others. Snoop’s “Bible of Love” album just recently debuted at #1 on Billboard’s Gospel chart and is available in stores and digital retailers now!